What an opportunity! This fresh and functional home is ready for a new family to enjoy. Positioned in one of the fastest growing suburbs on the Shore, the time to view is now! Minutes away from the ferry to the city and a quick stroll away from quaint Beach Haven Village, café culture, kids playgrounds and walk ways to the water. Beaches, sporting activities and scenic coastal walks at your finger tips... this is smart buying and makes sense on so many levels. - 3 good sized light filled bedrooms. - Indoor/out-door flow to sun drenched entertainment areas with breath taking sea view vistas. 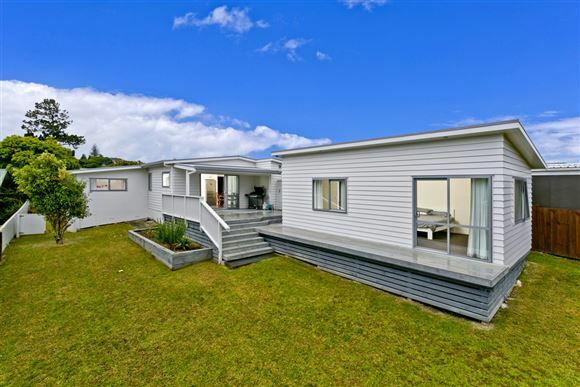 - A flow out to a kiwi dream flat back yard for kids to run and play. If you have been searching for a family friendly home then look no further, this property has all that you need and more...it is simply magic.